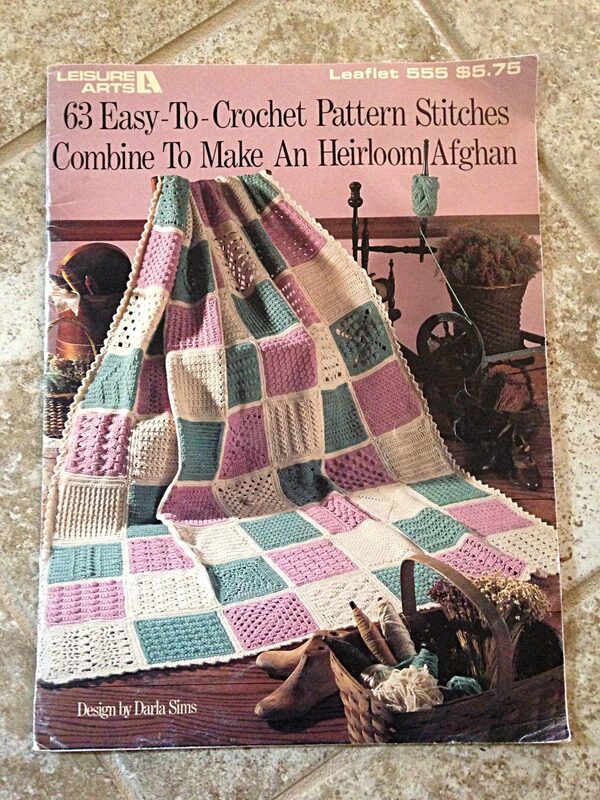 Old School Friday – An Afghan is Such a Treasure! 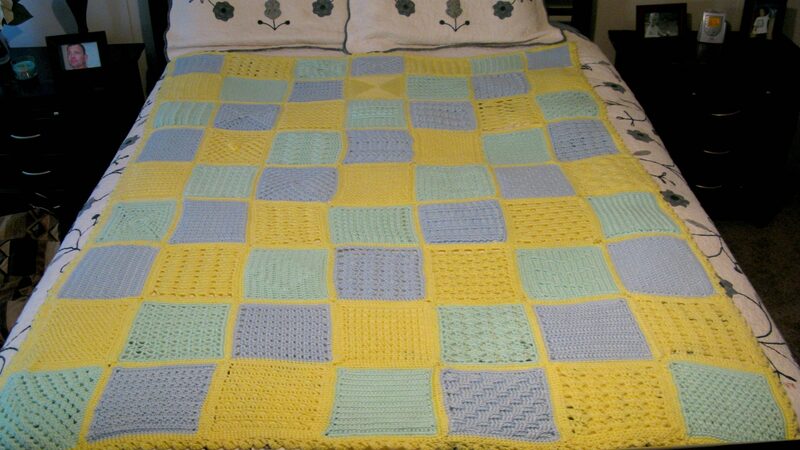 I can’t even remember the exact year I made this afghan for my son, but I’m thinking it was around 1999 or 2000. It was the day after Christmas when we made a trip to West Virginia to go skiing. My kids were still young and it was an exciting time for all of us. We were staying for 10 days, so I decided to pack a lot of yarn and a new crochet book I had recently bought. I knew when I bought the book it would be a challenge for me. Why? Because it was an afghan that called for making 63 squares and sewing them together. The typical me was great about starting projects but finishing was a totally different story. As you can see I did finish the blanket though. We were on top of the bunny slope (yep, just as it sounds. It’s where all the kiddies learn to ski), but when I started down the hill I gained a little too much speed. I’m not quite sure what happened next but when it was all over both skis had come off, and I was laying sprawled out in the snow. My head was throbbing, so when I touched the back of it…..blood. Ugh. Needless to say, the rest of the trip was staying in the room while everyone else had a good time. Now looking back, it was a peaceful time alone for a momma raising 3 young kids aside from the headache and huge knot on the back of my head, of course. Surprisingly I still have the pattern book. It was from Leisure Arts and has 63 different square patterns. I often reference the book for various types of stitches and inspiration. The patterns in the book are great for beginners because it is very well written and has diagrams for those tricky spots. I hope you’ve enjoyed this time in history with me! Don’t look too closely at the blanket though because you will probably see that some of the squares are upside down from on another. Yea…..I didn’t really read the directions once I finished all the squares to know that I should really pay attention on how to sew them together. I guess that’s one of the memories that makes me laugh every time I look at it. OMG! I have this one too. Only difference is, I have yet to put it to use. Good job on the blanket. They still sell this pattern book and I have 2 copies. I haven’t done the whole afghan but I use the different blocks as inspiration for other projects. I’ve still got the first afghan I ever made. It’s getting ratty in places, but it’s still the first thing I reach for on a chilly evening watching TV. great story. I have this same book! I refer to it often for stitch information too! Kathy, I bought and used this same exact book to teach myself how to read patterns!!!! I did finish the blanket… It only took me about three years!!!! Kathy… I have the same book and have used the patterns often… but didnt make the whole sampler!!! You are amazing… Sorry you hit your head and missed fun on the slopes though!! It always is a great conversation going down memory lane with the kids. We all get a laugh. I still use this book also. I never did the whole blanket but I do use it for the stitches.